In Europe and probably China – the train system has a number of safety controls which prevent operators from…Driving a train into a platform. Or, as in the case of the wreck in Philadelphia last year, going around a turn at speeds in excess of what the train can handle. This is all accomplished by the existence of a digital radio system, which monitors and manages the train for unsafe conditions. The reason we don’t have this is in part the FCC, and in second part Congress, which is often paid by special interests to suppress technology. So far in 2016 – 11 of the rail crashes in the entire world have been in the United States. That’s 22% of all the crashes. A commuter train in New Jersey crashed into Hoboken Terminal in New Jersey on Thursday morning, resulting in multiple injuries and visible structural damage. One person was killed and at least 65 people were injured, according to Gov. Andrew Cuomo of New York. 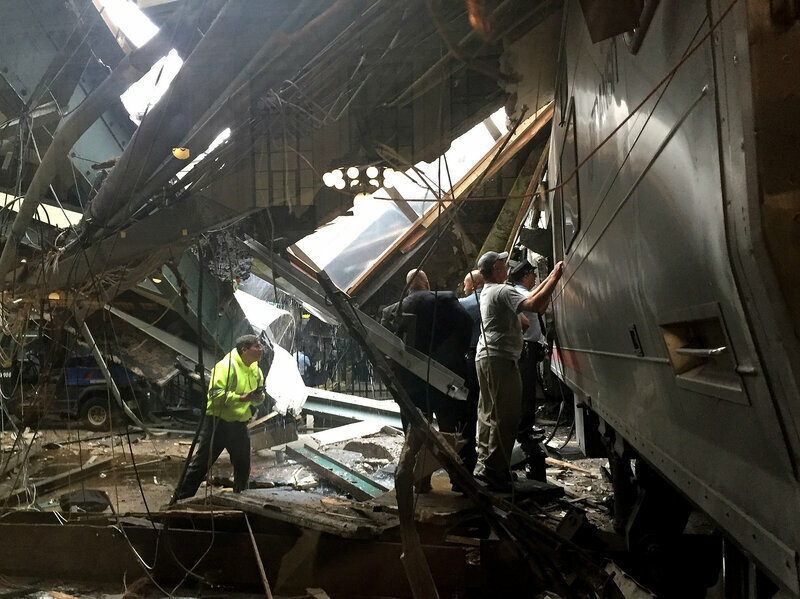 New Jersey transit officials said at least 100 people were hurt, Stephen Nessen of WNYC reports. Joseph Scott, the CEO of Jersey City Medical Center, said the hospital had admitted some victims in critical or serious condition. Gov. Chris Christie of New Jersey told MSNBC and CNN shortly before noon Eastern that everyone trapped on the train has been rescued or removed, and that there was no indication that the crash was anything but an accident. The train that crashed originated in Spring Valley, N.Y., and “collided with the platform” at Hoboken Terminal at around 8:45 a.m. Eastern, Cuomo said in a statement. Nessen reports that passengers on from the train that crashed say it approached the station at “full speed” before slamming into the barrier at the end of the track, with the impact throwing riders onto the floor. WNYC’s Nancy Solomon arrived on the scene shortly after the crash, and says she personally saw 20 to 30 injured people, including at least four who were unable to walk. Been to Haiti several times now, working on various projects. Never seen anything like this, short of walking through a war zone. The Haitian people are an amazingly resilient group. Unfortunately, after 300 years of failure, much of it induced by larger, more powerful countries – there just aren’t any easy fixes. Whether storm drains, septic line, water mains, telecom facilities, or electric lines there are just huge missing chunks – some of which have been patched over with makeshift fixes which would make McGuyver proud by ever-inventive Haitians. The good news is that work crews are steadily removing the rubble. The bad news is that there isn’t anywhere to put it, and the roads system, designed for light commuter traffic now have potholes the size of Grand Canyon everywhere you go from the heavy trucks. Getting from place A to B is an adventure in spinal readjustment. Could be done in a few months. Projects on that scale tend to take YEARS. Had at least 1/2 dozen folks email me this today to ask what I thought. Even popped up over at NewsOne. 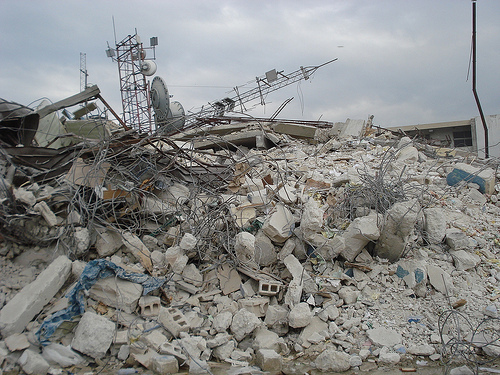 The earthquake that devastated Haiti also destroyed the nation’s feeble network for phones and Internet service. Except for cellphones, the population was largely cut off from communication. But out of the rubble, one U.S. wireless industry pioneer sees opportunity. John Stanton, founder of Voice Stream and former chief executive of T-Mobile USA, wants the Haitian government to forget about rebuilding its copper wire communications network. Instead, he thinks Haiti should go mobile.